Transferring people, minerals, and goods between Ancient Egypt and other faraway places was much more extensive and common than is generally imagined. The seas were not barriers, but high roads for active international commerce. Traveling by water has been (and continues to be) the most effective, economical, and safest way to travel for both people and goods. Travel by land complements travel by water for major/large goods. The Ancient Egyptians had the means to travel the high seas with a large number of high quality ships. They also had the geographic knowledge to travel the open seas. The evidence shows that their means and knowledge enabled them to reach the farthest countries of the earth. 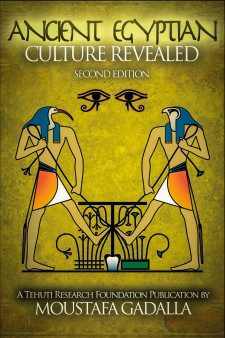 The following pages will detail the wealth of high-quality ships and Ancient Egyptian knowledge of high seas travel. 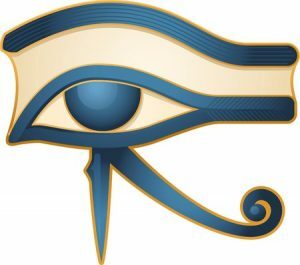 Previously we showed the Ancient Egyptian knowledge of the stars as well as the surface of the Earth (including water). Ancient Egypt had the means, knowledge, material, and experience to transport people and goods by sea and land. The quality of the Ancient Egyptian ships were truly recognized and appreciated when the Khufu (Cheops) boat (4500 years old) was found next to the Great Pyramid in Giza during the 1970s. That boat, now housed in a museum next to the Great Pyramid, is superior and much more seaworthy than Columbus’ Santa Maria, the Mayflower, or the Vikings’ ships. The physical evidence is clear: the Egyptians had the means to travel on the high seas. Sizes of even larger ships than Khufu’s will be detailed later. Khufu’s boat is one of the largest ancient ships found to date. The longest of Viking boats found in Europe was about 98.5 ft. [30 m], while Khufu’s boat is 142.5 ft. [43.4 m] long. It is about 19.4 ft. [5.9 m] wide and 5.75 ft. [1.75 m] deep and has a displacement of over 40 tons. The prow, formed in the shape of a papyrus-bundle, is about 20 ft. [6 m] tall. Its stern rises to 23 ft. [7 m]. Its rudder consists of two massive oars. The boat has several cabins on its deck. There is some evidence that Khufu’s boat was actually used in water. Marks caused by abrasion between the ropes and the wood of the vessel are still clearly visible in many places. The boat consists of several pieces of wood that are held together with ropes. The ropes shrink when wet, while the wood expands when wet. Such shrinkage and expansion provided tight, secure seals, and eliminated any need for metal nails. This method of boat construction allowed the Ancient Egyptians to disassemble the boat and carry the pieces while traveling on land, until they reached a safe and navigable waterway. This ingenious construction technique allowed the Ancient Egyptians to travel deeper inland. Numerous Ancient Egyptian papyri from all ages testify to this method of land/water travel. The Ancient Egyptians were famed throughout the Mediterranean Basin for their shipbuilding, even though the timber necessary for large-scale carpentry and for boat building was unavailable in Egypt. The Ancient Egyptians had a large fleet, as evident from the huge quantities of timber that they had imported from Phoenicia. The need for timber supplies explains, at least in part, the importance of the permanent settlement—a kind of protectorate—which the Egyptians had with the Phoenicians from the earliest days of the Old Kingdom [c. 2575 BCE]. 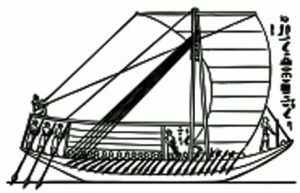 The Egyptians built a whole range of practical boats, well adapted to different uses and to the geography and climate, for the transportation of both passengers and freight. The Egyptian ships traveled the waters of the Nile and the high seas since the most ancient times. Ships varied enormously in size. Some of them were huge. Diodorus mentions one, made of cedar and built during Sesostris’ reign, which measured about 450 ft. [140 m]. All types of commercial and military vessels were known more than 5,000 years ago, transferring goods to the northern shores of Britain, Ireland, and Europe. This was long before the Phoenicians became seafarers in the 1st millennium BCE. In very early times, boat building was extensively conducted. Even under the Old Kingdom [2575–2150 BCE], boats were built of large dimensions – thus, we hear of a broad ship of acacia wood, 60 cubits long and 30 cubits broad. . . i.e. nearly 100 ft. [30.5 m] long and 50 ft. [15.25 m] across; and know that a boat of this immense size was put together in 17 days. The pictures under the Old Kingdom represent several types of boats, such as square boats, stern boats, towboats, etc. Each type is fit for certain functions/situations. Several types of boats were utilized at harbors such as Canopus (pre-Alexandria), to suit harbor operations. Besides the freight vessels, there were special small boats that were used for carrying smaller loads. Some very large freighters were used for transporting grain, stone, bricks and even the gigantic obelisks, which were hewn out of a single block in the quarries of Aswan and then carried on the river to the site of the temple in Luxor and elsewhere. Nearly all the boats were made to be adaptable for sailing as well as for rowing. When sailing was impossible (owing to contrary winds, or if going through calm navigation canals), the sailors utilized towing techniques of towlines and smaller boats. Vessels that were intended to carry large freight were towed either by men or by other vessels because they were too heavy for independent movement. Therefore, even during the Old Kingdom, most vessels were provided with a strong post on which to tie a towing rope. Many towboats were provided with short perpendicular posts at both ends for the towline. They were steered, like all vessels of the Old Kingdom, by means of long oars. This kind of vessel was employed in the transport of blocks (they could carry tremendous weights) from the quarries. The rudders of most Ancient Egyptian ships, since the Old Kingdom era, consisted of two massive steering oars. Throughout Egyptian history, most boats were decorated and adorned in the fore part with large paintings. The stern resembled a gigantic lotus flower; the blade of the rudder-oar resembled a bouquet of flowers; and the knob at the top was fashioned into the head of a neter (deity). The Ancient Egyptians also had a naval flee;, the size of which varied according to defensive needs on the high seas during the different eras of Ancient Egyptian history. Special boats were built purposely for war. Herodotus and Diodorus both mention the fleet of long vessels, or ships of war, fitted out by Sesostris on the Arabian Gulf. They were 400 in number, and there is every reason to believe that the trade, and the means of protecting it with ships of war, existed there at least as early as the 12th Dynasty, about 4,000 years ago. The galleys (ships of war) employed to protect the traveling commercial fleet from sea piracy outside of Egypt differed from those of the Nile. They were lower at the head and stern. On each side was a high wooden bulwark along the entire length of the ship. It protected the rowers from the missiles of the enemy. The handles of the oars passed through an aperture on the lower part. The commercial and naval ships were served by several ports, guiding landmarks, water markers, loading and unloading facilities, freshwater supplies, comfort stations, and amenities/necessities. Several roads, along with supply stations, were provided between the seaports and the populated centers along the Nile. The strategic location of Egypt’s waterways facilitated commerce between the (then) three active continents of Europe, Africa, and Asia. Man-made navigation channels allowed access between the Mediterranean Sea at Canopus (Alexandria) and the navigable River Nile channel. Another navigable channel connected the Nile to the northern tip of the Suez Gulf, which allowed access to the Red Sea, Africa, India, and the Far East. In addition to the frequent harbors along the navigable River Nile, there were/are significant harbors along the Egyptian coasts of both the Red Sea and the Mediterranean Sea. Such harbors allowed transportation of goods and people to and from all continents.